In 16 years Charles Johnson mentioned only his mother and his brother. Now he claims to have relatives that could have perished in the WTC attacks, but they didn’t, and any one of us could claim the same damn unprovable thing. That’s some amazing unfettered idiocy right there. I never cared much for Bob Dylan. He was talented but too pretentious for my taste. On the other hand, I hereby dedicate this song, on behalf of The Diary of Daedalus, to Charles F. Johnson & Viscous Bouche, aka Alouette. Update: Apparently a lot of people took notice of Johnson’s Idiot Wind, including Weasel Zippers and The Washington Times. Many (of the 38k+ banned) ex-lizards ressponded in the comments sections of both. Enjoy. Update 2: The Daily Caller also picked up the story [h/t ChenZhen]. For new visitors to this site, don’t miss The Breitbart Project, aka “The Ruse And Fail” series. If you’d Rather not wade through a concise history of Little Green Footballs, at least read this. Charles, we just can’t give you enough to make up for what you’ve given us and others over the years. Your fundraisers and generous contributions to charitable causes has been an inspiration to many of us who have followed Little Green Footballs since its inception. Your support of Judeo-Christian values is beyond reproach, especially during this Holiday Season, and we are truly in awe of your unselfish philanthropy. May God bless you and Little Green Footballs for saving so many lives from destitution, and we wish you a very Merry Christmas. White Progressives have taken their white hooded sheets out the closet and have been digitally lynching Mia Love over the past week. 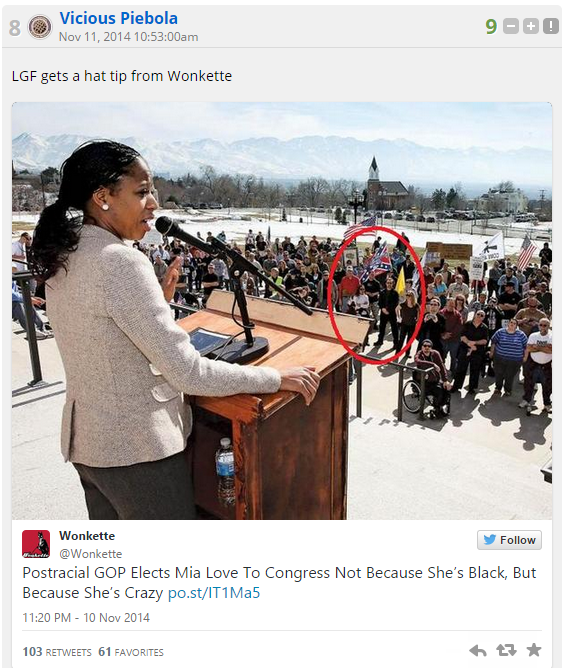 LGF’s resident kapo was one of the contributors to the racist attacks on Mia Love. Now she rages that Wonkette linked to her racist screed. The resident Kapo of LGF went berserk over a “You Might Be A Conservative” twitter rant. Alouette draws up strawmen to attack conservative positions. YouMightBeAConservative if you think raising #MinimumWage will cause all prices to go up but lowering CEO pay won’t make prices go down. Alouette is just a parrot devoid of any intellectual thought process. Viscous Bouche, children aren’t lobbing missiles into Detroit, but in your world, teenage voodoo ninja nuns are. Where are the photos of Israeli children killed by the Palestinians? Where are the photos of damage and destruction of Israeli property by the Palestinian rockets? Where are you when it comes to defending your own relatives and ancestors unless you are a kapo? “Judaism Rejects Zionism.” Really, Alouette? Go polish your silverware, swab your ears with a spayed cat named Charles, then tweet about it. Alouette, you’re more than a kapo. You’re an idiotic mess. Alouette loves to act like a righteous person, but in reality she’s a nasty old hag who insults minimum wage workers.